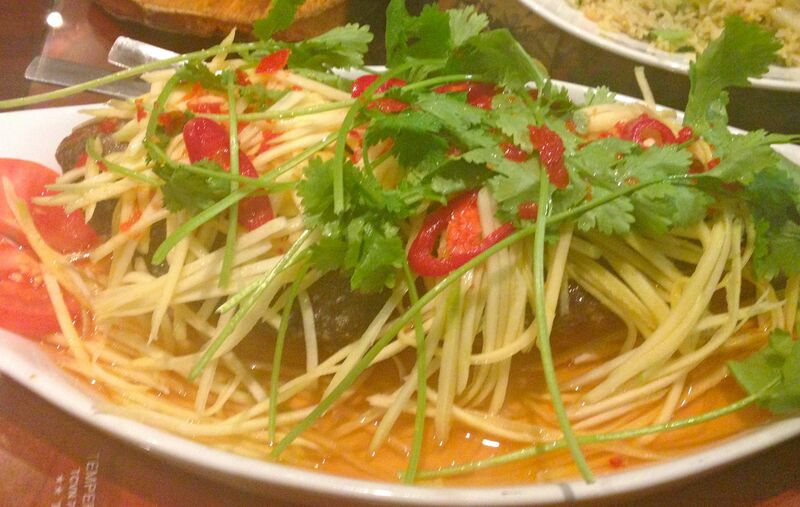 So on a wild and wet May night we ventured out onto the streets of Battersea to try something Vietnamese. This local eatery is run by Mr Su Tran and Mrs My Lee who are from South West Vietnam. The restaurant is named after the area they originate from and they serve great dishes from the region. On what was a thoroughly unpleasant Tuesday night (weather-wise) this buzzing little restaurant was packed with locals all tucking into an array of tasty dishes. The menu is amazingly diverse with everything from spring rolls to stir fries, to soups, seafood and even frogs legs and eels. We began with two amazing starters. A plate of goodies is placed in front of you and it’s time to assemble your parcels, dip them in the sauce and eat…a lovely ceremony. The chargrilled pork balls with honey and spice came on a small bed of noodles, with large lettuce leaves, plenty of fresh mint and pickled carrots and cucumber.Roll it all up in the lettuce and you’re ready to go. I’ve rarely tasted such tender and flavourful pork and the fresh herbs added a lovely zing. 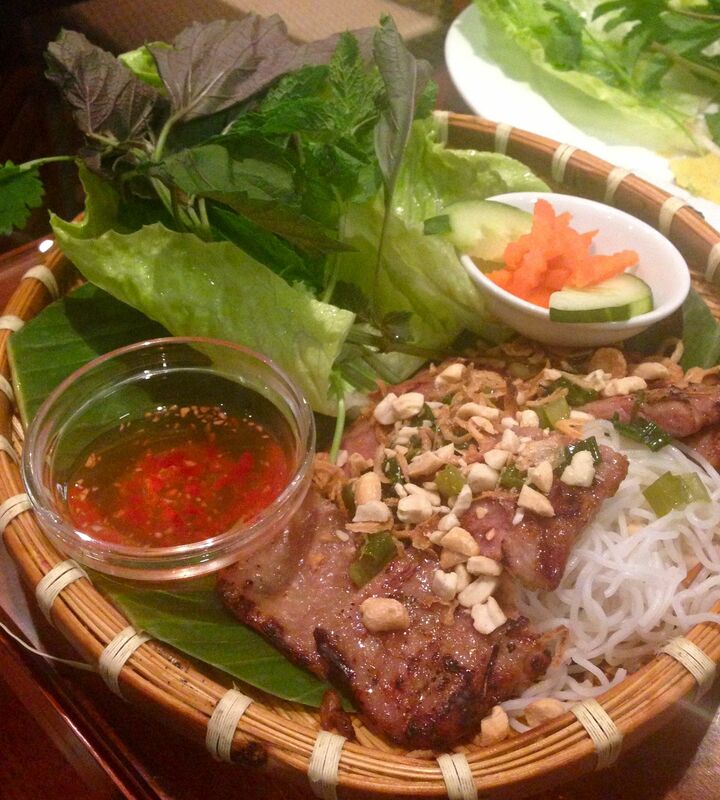 Fresh herbs are huge in Vietnamese cuisine and really make these starters something even more special. Loved the basket it was served in, too. 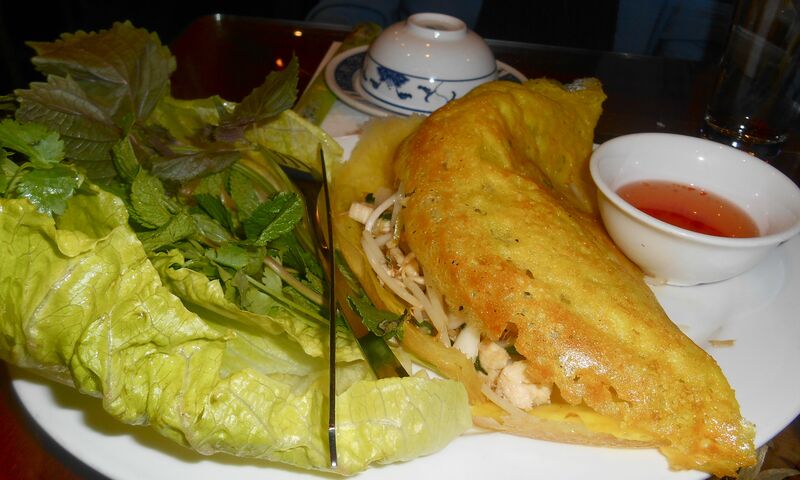 Next up, traditional crispy pancake stuffed with chicken and beansprouts. This package needs to be sliced and again wrapped in the lettuce leaves with more herbs, before dipping and munching. Both the starters were on the substantial side and light and so tasty we polished them off in no time. For main courses we asked our lovely waiter for his recommendations. The whole crispy fried sea bream was served with fish sauce and loads of fresh, shredded mango plus more herbs, coriander this time. The crispy skin and sweet, succulent sea bream were a revelation and melted in the mouth. We did also order the much-talked-about stir fried goat with galangal which came in a beautifully rich sauce. Unfortunately my pictures weren’t the best for some reason, so you’ll just have to take my word for it. 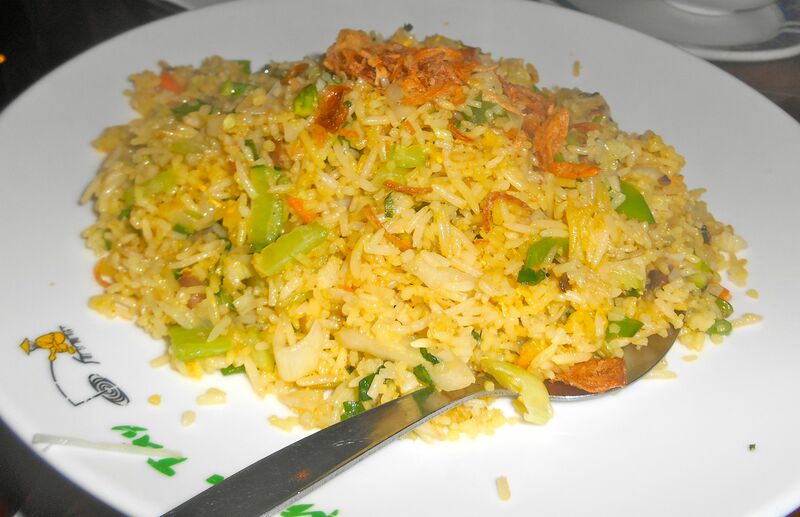 A plate of delicate, perfectly fried rice and vegetables completed our feast. Each of the glass-topped tables has a little surprise nestling underneath. 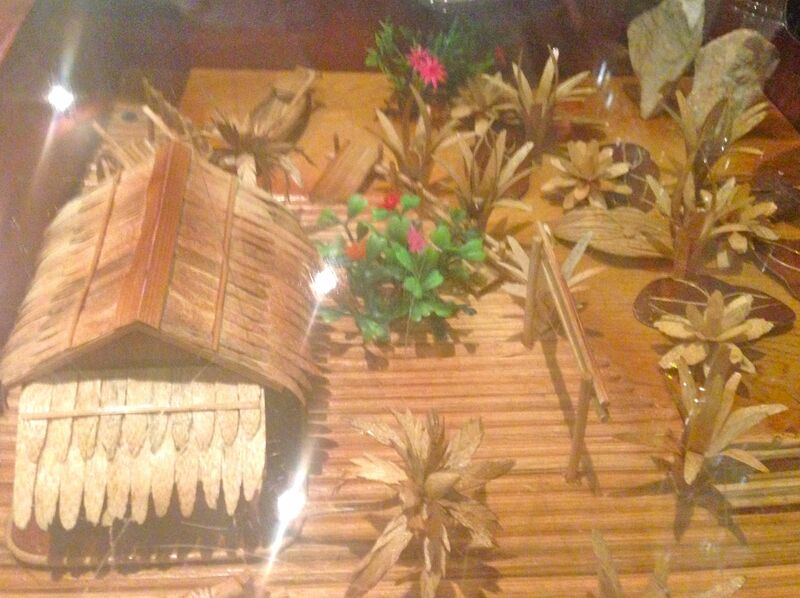 A miniature village complete with a house, boat, river, fisherman, flowers and foliage. The care and attention to detail blew me away, I simply had to share a picture with you, despite the reflection off the glass. What a lovely idea. I’m a relative novice when it comes to Vietnamese food and every time I eat it, I love it more. Its fresh, light and truly unique and gotta love all the herbs. 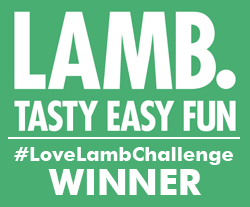 This is an extremely popular place which isn’t surprising when you consider the amazingly reasonable prices, friendly service and high quality of food. Starters (and they’re large) are around £6, Seafood mains around £7 and huge bowls of traditional pho (soup) around £7-£8. Oh and it’s only five minutes walk from Clapham Junction station (and they do takeaways)…guess what, on my way home…plenty of opportunities for more visits then.